Up until now, we’ve explored the tangible side of training. Concepts like incorporating speedwork to get faster, adding hill work to get stronger, or planning ahead to avoid race-day mishaps are some examples. However, there still remains one mysterious component for which the answers aren’t so black and white: the mind. The mind greatly influences performance both positively and negatively. Positive thoughts enable an athlete, while the opposite can ruin a race. The best racers know how to manage their inner voice by redirecting or quelling negative self-talk. In order to better understand how the psyche can affect our running, I enlisted the help of sports psychologist, leadership consultant, and ultrarunner Dr. Stan Beecham. Beecham is the author of Elite Minds and has worked with numerous collegiate, Olympic, and professional athletes and teams. Here we’ll work through some of the most common and, unless managed, eventually destructive themes. It’s a scenario that resonates with many ultrarunners once they’ve committed the time and money to an event, but soon find themselves staring at what seems like an impossible task. Unless controlled, an accumulation of anxiety can have deleterious effects on the runner’s season. There’s a reason you didn’t register for a 10k or marathon. You’re looking for more. In his book, Beecham discusses the difference between the necessary, the possible, and the impossible. “When you are beginning a task, a day, a job, or even something that feels impossible, just do what you can. That’s what necessary means. 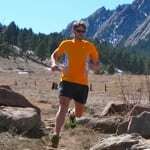 Do the ‘have to’ stuff first; complete your to-do list.” For an ultrarunner, that’d be to go for a run. At the end of each day, ask yourself if you’re doing all you can. Did your workout have a purpose and did you complete it in its entirety? Are you following a strengthening and flexibility routine? Have you been doing race-course recon? Are you researching and testing the appropriate gear and nutrition for your event? Are you getting enough sleep and eating well? If you can answer yes to most or all of these questions, then your apprehension should subside. As you plan for what seems like a daunting event, you have the ability to achieve what seems impossible simply by committing to the possible. During my preparation for the Slam, I took one day at a time and focused on getting done all that I could. My time was not only filled with scheduled workouts, but also personal and professional commitments. Rather than expending energy worrying about the Slam, I ended each day satisfied, knowing that I’d done all that was possible, and arrived to the four start lines confident and prepared. In 2000, I badly injured a hip flexor. Every day for five months, I put on my running clothes and attempted to run, but never made it past the mailbox. I couldn’t run, race, or do what I loved. My self-esteem and confidence waned. Runners view injury as a game-ender, but they shouldn’t. “Don’t think of yourself as a runner,” says Beecham. “Think of yourself as an athlete.” An athlete is a person proficient in sports and physical exercise. If you can no longer run, change your game. Challenge yourself or others in the pool and at the gym. During my nearly half-year layoff from running, I turned to cycling and became proficient enough to join a team at the 24 Hours of Moab mountain biking event. Training for this allowed me to see new trails, stay fit, and accomplish new goals. During last year’s Tahoe Rim Trail 100 Mile, I found myself quietly wishing a cougar would eat me or a rock would fall on my head. Anything would have been an improvement to the agony I was suffering in the dark at the 70-mile mark. I was plotting my escape to the closest road and car ride to my hotel room. I wasn’t anywhere near where I had hoped to be place-wise or time-wise, I felt like I had really blown it, and I wanted the race to end. I was smack dab in the middle of a long and dreadful pity party. Beecham suggests that we look to other sports. For example, in football, basketball, golf, boxing, or soccer, each team or player wants his or her opponent to play well because it forces the other side to compete harder, better, and smarter. In an ultra, you may be competing against other runners or you may be competing against the course. Back at Tahoe, I remembered that I had sworn in advance that I would finish, even if my other goals were unattainable. So I stopped feeling sorry for myself, took a nap, ate some food, and ran the last 20 miles to the finish. The games we play in our heads are complicated. The circumstances we’re confronted with during a long training block or a race are wicked. The choices we have to make aren’t easy. It’s only natural to doubt our ability or lament our predicament when faced with adversity. We all know that the easiest and quickest way out is to pull the plug. However, before abandoning your goal, consider your other options. This may be all you need to continue forward. Don’t quit simply because you can. What head games do you play with yourself when things start to get hard? Have you found yourself in a running pity party? If so, how did you escape it and move on? This: “Don’t become fixated on what you can’t do. Stay active, push yourself in other ways, learn a new sport, and continue to compete. Do something that makes you feel good about yourself.” I've battled injury for a while now, and been around a lot of people in the same spot. The toughest part is staying positive and motivated. You just have to reframe it as an opportunity to diversify, get stronger, and come back better- even if it is a really long road. Many people think a real flow/zone experience has no room for second guessing or doubt. In my experience, that is not the case. Even while leading and essentially having a race "locked up" it is common to fantasize about taking a wrong turn, falling down or just about anything to make the pain stop. The pain of exhaustion is overwhelming and it is natural for the brain to tempt the body to quit. It is written into our DNA to not bite off more than we can chew. To go hard and long, but not so hard that we can't go out and hunt the Savannah again tomorrow. It is vital to acknowledge this phenomenon and recognize that even the winner of the race has these feelings. An honest and open dialogue with yourself at these points is critical. Remind yourself that you are exactly where you want to be, doing exactly what you want to do. Smile, take a look around and get moving. Nice article Ian! Thanks for sharing your thoughts. When I’m feeling bad I like to tell myself “If it was easy, everyone would do it.” I thought that was an original thought. However, since you mentioned it in your article, apparently it’s not. Good luck in 2014! Have fun!! Last year I had a poor run at Cascade Crest. I came in to the race in great shape, but allowed myself to spend a lot of time on negative thoughts. The result was I gave up racing for the last 40 miles.__Two months later, with little training inbetween, I had my best personal performance at an ultra. True, the competition was less, but I'm talking about my own performance. I led through 52 miles of the Peacock 100k. I even led all 50k runners through the first half. When I saw a runner just three minutes back at 52 miles I had a choice. Let them take it, or give everything I had regardless of any other runners. The most exciting part was feeling that despite lots of doubt and thoughts of quitting, I managed to run in a 'zen' zone and really rise to the occasion despite less than optimal conditioning!__Last month I dropped from second place at HURT at mile 85 due to a calf injury. Have it happen for real now, I can say that despite fantasizing about dropping due to injury and ending the pain… this is something I never want to repeat! Great article!! Thanks for sharing your TRT100 experience, Ian! I think it shows us the most important lesson: when things get rough, eat! Sweet article, I missed it over all the great race results. I was just thinking about this over the past weekend during a 50k race. At mile 15 "the beast" showed up. I said, ah, the beast is here. The beast is tightness, nausea, cramping, bad weather, and/or self-doubt, etc. It can take many forms. I try to look forward to the beast making its appearance. On good days I can embrace the beast and run with it. On bad days, the beast wears me down and little pieces of me gradually give up. I hope to be mentally strong enough one day to genuinely have joy when the beast makes its appearance. Thx Ian. The mental aspect is definitely the biggest part of it all for me.